After lifting weights, you should feel strong and triumphant, not weak and achy. Unfortunately, back pain and weightlifting often go hand in hand; a strain that occurs in your lumbar spine, or lower back, is commonly referred to as "weightlifter's back." Monitor your symptoms carefully to make sure the pain is not indicative of a condition more serious than a sprain. Back pain is often the result of strain on the ligaments or muscles. Sensations may range in intensity from a mild twinge to a chronic feeling of pain. You may have painful spasms or feel that your lower back is sensitive when you touch it. Weakness in your spine and numbness may signify a serious problem. If you lose control of your bladder or bowels, it is an emergency and you must seek medical attention immediately. Back pain may be caused by poor posture or technique. If your back is rounded, your hips are put at a high angle that stresses the ligaments. When you lift weights, it adds additional stress that can lead to strain. Keeping your shoulders stable and engaged will help keep you from rounding your back. Squeeze your glutes when you're lifting the weights up to engage your pelvis and keep yourself from hyperextending your lower back. You should seek medical attention if your pain continues for more than a few days. Generally, your back pain will go away if you rest and avoid activities that put stress on your back. Sleeping on your side will create less stress than sleeping on your back or stomach. An ice compress and over-the-counter medication may be soothing. Core Physicians recommends doing some light exercise such as walking to stimulate the strained area, but only if you have enough mobility. To help prevent a back injury, Spine-Health recommends using lighter weights and doing more repetitions. It may be helpful to use an exercise machine instead of lifting free weights, as this will provide you with more support. 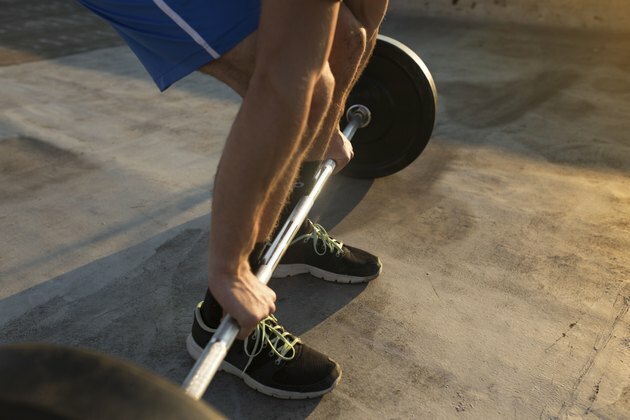 You may wish to avoid certain weightlifting moves that come with a high risk to the back such as squats, deadlifts, clean-and-jerks and snatches. This is especially true for individuals over 50. If you sit for a long period of time at work, take brief breaks and walk around to lessen pressure on your spine.